Revelle College Council (RCC) is Revelle’s student governing body. 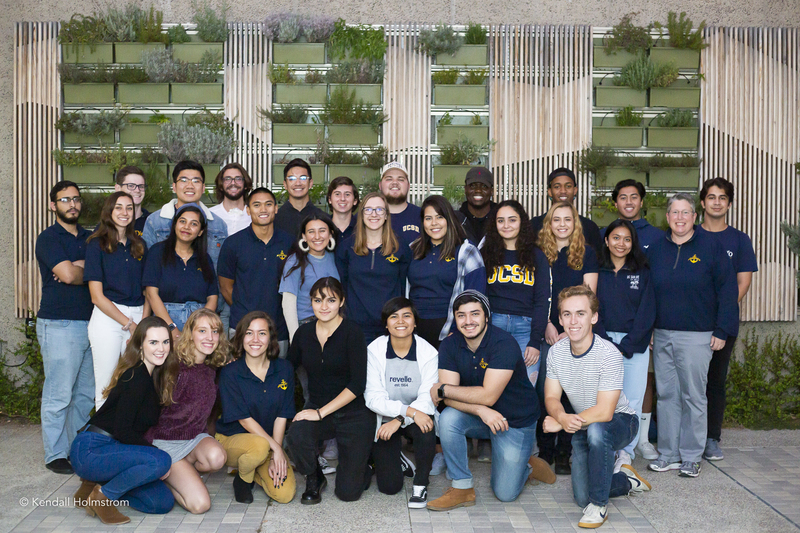 Duties of the council include providing oversight for Revelle's student activities fee, promoting student organizations and events, and providing a means for Revelle students to get involved. Meetings are held every Thursday at 5:00pm, in Revelle Formal Lounge, beginning week 1. Transfer Representative and Student Fee Advisory Campus-wide Representative postions now available! Apply now! For more information, contact Hunter Kirby at rccvicepresident@ucsd.edu. Interested in what your Student Government is doing? Check out the official meeting minutes from the weekly Council Meetings. The Revelle College Council creates, approves, and manages a quarterly budget. If you have questions about the RCC finances/budget, please contact Hunter Kirby, RCC VP Finance, at rccfinance@ucsd.edu. RCC Finance Committee Meetings: Tuesdays at 6:00 pm in Revelle Conference Rooms A & B. NOTE: The Post Event Report Form must be submitted within 7 days after the event date. This Bookstore Advisory Committee assists the UCSD Bookstore management in making operational improvements, determining and reviewing short- and long-range goals, and reviewing general service and operational philosophy. Its charge includes a responsibility to establish and maintain two-way communication between Bookstore management and various segments of the university community. The Library Student Advisory Council serves to facilitate communication between students and the Library, and to convey student needs, concerns, and priorities to the Library. In addition, they: provide advice and feedback on library policies and services; provide ideas and input on the design and implementation of new library services; seek to improve the student experience within library spaces; provide insight into student study, research, and library use habits; and communicate information about library services and resources to the student community. This is a policy-recommending group that is advisory to the Vice Chancellor for External and Business Affairs. The committee reviews and makes recommendations to the Vice Chancellor on policies, contracts, budgets, rates, and levels of service for on-campus residence halls, single undergraduate apartments, and dining services contiguous to the colleges. The Student Organized Voter Access Committee is a non-partisan student organization which seeks to increase voter registration rates within the UCSD community, facilitate a positive discussion about voting, and encourage student voter turnout. SOVAC performs these services by being the primary representative for voter registration on the UCSD campus, holding informational workshops, executing a non-partisan advertising campaign, and collaborating with a variety of student groups. The Recreation Facilities Advisory Board (RFAB) is the principal advisory committee on sports facilities and related policies at UC San Diego. RFAB operates under this charter with the approval of the Chancellor, the Associated Students, and the Graduate Student Association. RFAB is charged by the Chancellor and given the responsibility of ensuring that the sports facilities have the emphases, breadth, and coordination to complement optimally the philosophy, missions, and goals of the University. The Student Conduct Standards Group is tasked with assisting the Office of Student Conduct in an annual review of potential changes to the UC San Diego Student Conduct Code; participating in a complete review of the UC San Diego Student Conduct Regulations; and reviewing, requesting feedback from constituents, and commenting upon proposed changes to the University of California System Policies applying to Campus Activities, Organizations and Students (PACAOS). The UCSD Student Fee Advisory Committee (SFAC) is charged with evaluating Student Fee Funded Units and making recommendations on allocations of the Student Fees. Furthermore, SFAC's duty is to ensure that the proposed Student Fee uses are in the best interests of the University and its students, and in compliance with existing policies and guidelines. The University Centers Advisory Board (UCAB) is a student majority board chaired by a student whose purpose is to assure the University Centers (Price Center and Student Center) will achieve its mission and be a unifying force among students, faculty and staff for social, cultural intellectual activities, and services, and to provide opportunities to broaden interpersonal relationships and self-enhancement within a large university. The Well-Being Cluster Student Advisory Board (WCSAB) provides guidance to the Executive Director of Student Health and Well-Being, and the directors of the departments within the cluster which include: Counseling and Psychological Services, Student Health Services, Sexual Assault and Violence Prevention Resource Center and the Zone. The WCSAB helps to ensure that the health and well-being needs of UC San Diego students are identified and met, and their interests are represented in the development of policies, programs and services that support their health and well-being. The WCSAB helps to set future direction of health and well-being services including reviewing fees and providing input in the negotiations of the UC system-wide Student Health Insurance Plan (UCSHIP). HBLP is an initiative to ensure the academic success of every student. Funded through the Revelle College Council, this program provides books for students who could not otherwise afford to purchase them. Students who are interested in participating in HBLP only have to go to the College Center located in Blake Hall with a valid UC San Diego ID. Students may borrow up to 3 books for a total of 24 hours. If you run out of time while conducting independent critical assessments, just call the College Center at (858) 534-4545 for a time extension. Keep a tragedy from happening and help other Revelle Students succeed in the Humanities sequence! Come by the College Center and donate your old books to the program. Revelle College Council is pleased to offer new student services, including the Revelle College Rental Program! This offers the opportunity for students to borrow board games and chairs for 24 hours in exchange for their PID and contact information at the College Center desk at the bottom of Blake Hall. Questions or concerns? Contact the Director of Student Services at rccdss@ucsd.edu. Learn more about Revelle Rental Services, brought to you by RCC!